The <feComposite> SVG filter primitive performs the combination of two input images pixel-wise in image space using one of the Porter-Duff compositing operations: over, in, atop, out, xor, and lighter. Additionally, a component-wise arithmetic operation (with the result clamped between [0..1]) can be applied. This element implements the SVGFECompositeElement interface. 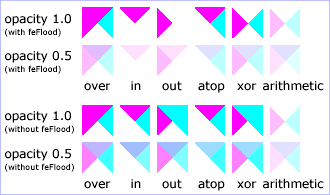 <svg width="330" height="195" viewBox="0 0 1100 650" version="1.1"
<desc>Define two sets of six filters for each of the six compositing operators. The first set wipes out the background image by flooding with opaque white. This image shows just the desired effect. The definition of '<feComposite>' in that specification. Working Draft Added lighter value for operator attribute. Chrome Full support 1 Edge Full support Yes Firefox Full support Yes IE ? Opera No support No Safari ? WebView Android Full support Yes Chrome Android Full support Yes Edge Mobile Full support Yes Firefox Android ? Opera Android ? Safari iOS ? Samsung Internet Android ? Chrome Full support 1 Edge ? Firefox ? IE ? Opera No support No Safari ? WebView Android Full support Yes Chrome Android Full support Yes Edge Mobile ? Firefox Android ? Opera Android ? Safari iOS ? Samsung Internet Android ? Chrome No support No Edge Full support Yes Firefox Full support Yes IE ? Opera No support No Safari ? WebView Android ? Chrome Android No support No Edge Mobile Full support Yes Firefox Android ? Opera Android ? Safari iOS ? Samsung Internet Android ?